This month, Epson as a global leading manufacturer in printing industry has represented its new printers in a special exhibition in Dubai—Sign & Graphic Imaging Middle East 2016. They are two series of large format printers: SC S40610, SC S60610 and SC S80610; and SC F6200 and SC F7200. The SC-S series use signage and SC-F use dye sublimation technology. Both the series help improve productivity, streamline workflow and reduce costs. The SC-S line-up of the machines geared towards the producers of signage and high-end décor and displays. They provide seamless operation and professional quality images. The printers can produce exhibition displays, backlit panels, posters, POS materials, vehicle wraps and wallpaper on a great variety of substrates. 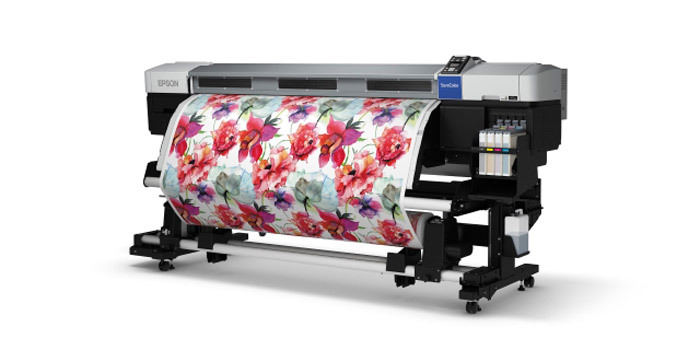 The SC-F line-up of the printers is ideal for creating high-quality printed textiles, allowing textile producers, promotional product companies and photographic studios to produce clothing, sportswear and home textiles, including mugs and phone and tablet covers. They even can print photos on metal and wood. The models feature the latest generation Epson PrecisionCore TFP printhead and a new formulation of Epson UltraChrome inks, resulting in the outstanding output with excellent colors and clarity. This entry was posted on Tuesday, January 5th, 2016 at 10:28 pm	and is filed under Epson, inkjet, photo, printer. "3D Systems On CES 2016 News"